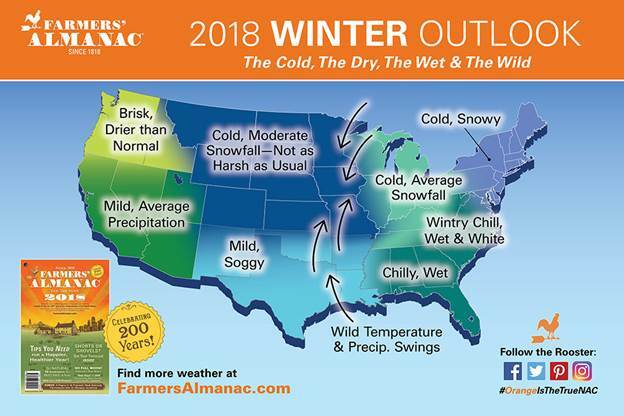 It’s finally here…the Winter Outlook from the Farmers’ Almanac! Okay, truth be told as professional meteorologists we don’t exactly wait on the edge of our seat for the Farmers’ Almanac forecast. Nonetheless, it’s still fun to look at the weather folklore forecast for comparison's sake. Notice here in Texas the forecast calls for wild temperature and precipitation swings with a steady flow of moisture from the Gulf of Mexico. In North Texas this corresponds to what we would expect during a “normal” winter. Big temperature swings are common in North Texas during the winter months. Strong December cold fronts (affectionately known as Blue Northers) have been known to drop the temperature over 40 degrees in a single swoop! In addition, it’s not uncommon to experience an abrupt transition in precipitation. The NBC 5 Weather Experts cannot agree entirely with the Farmers’ Almanac prognostication. Instead of weather folklore, we rely heavily on the El Nino/La Nina pattern when making seasonal forecasts. The current El Nino/La Nina phase is neutral, meaning neither one is taking precedence. This pattern is expected to hold and would likely bring a near normal winter to North Texas. That's when we usually see crazy winter weather there’s a link to El Nino or La Nina. In a normal North Texas winter one can expect around 33 freezes and 1-2” of snow.